Since 1954, the Washington Elks Therapy Program for Children has provided home-based occupational or physical therapy to children with developmental delays or physical disabilities. Services are provided at no cost to the family served. From a single therapist covering Washington State over 50 years ago, the program has evolved into an integral, vital, and much appreciated part of the statewide healthcare community. The success of any program is reflected in its longevity and its value to the community and the individuals it serves. Through providing critical one-on-one pediatric therapy for children most in need, the Washington Elks continue their long tradition of service to our community. Any child in Washington State with an Occupational or Physical Therapy prescription for treatment and whose family lives within reach of our therapy team is eligible, however only the most critically in need can be accepted into the therapeutic program. While the children we serve range in age from birth to 21, preference is given to infants and young children, those who are medically fragile or who would otherwise go without services due to the family’s lack of resources, and to children who without therapy will experience deterioration in their status. Eligibility for services does not require affiliation, membership, or association with the Elks, any of its members or lodges. 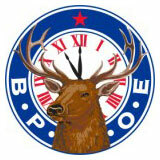 For more information visit the Tall Elks website or click on the above logo.